April Fools: ‘The Giant Surprise’ Next Narnia Film? Hope you enjoyed our April Fools jokes this year! Walt Disney Pictures currently has The Chronicles of Narnia: The Giant Surprise listed for Summer 2013. Monsters, Inc 2 is also listed. 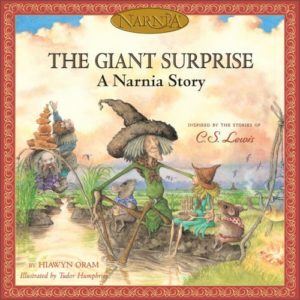 Based on characters originally featured in C. S. Lewis’s The Chronicles of Narnia, The Giant Surprise is a brand new Narnia adventure story about Marshwiggles, giants, and mice for young children. Lally, a small wigglet, and her Uncle Puddleglum undertake a hair-raising rescue of their mice friends, before they become a giant’s supper. This new picture book—and the others in the series—shares the values of C. S. Lewis’s original work and explores a world of courage, kindness, and companionship. Thanks to ‘Caspian-11th’ for the find! GlumPuddle, you’re really trying your luck with this one….Before we know it, Michael Flaherty will be informing us that marketing research has found "Lally" to be more likely to succeed with moviegoers than Jill Pole. Haha! "The book C.S.Lewis didn’t write"! gP =) Thats the best april fools joke ever! OK, wait. Is this serious, or a joke??? Someone please tell me the truth :)! Today, it is April Fools’ Day, isn’t it? I’m just waiting for April 8th! What is this? What about MN? *rolls on the floor laughing* HAHA!! yay April Fools!!!!! That is for sure!!! I almost believed it until I looked at the other posts and looked at the list of upcoming disney movies!!! What a disaster that would be!!!! Gp u outdid yourself! >_< Lets all hope and pray this stays a rememberable April Fools joke! It’s the story C.S. Lewis never wrote, of course! Oh, oh, please don’t joke about this…I’m still trying to wipe Suspian from memory. Suspian is Susan + Caspian. Wost addition to a Narnia movie ever. As an April Fool’s joke in 2006, NarniaWeb posted that Susan and Caspian would have a romance in "PC". I wouldn’t say it’s exactly romance. I would call it…..Um, something else. I call it: "YICK! ", NNNNOOOOOOOOO! ", and "ARE YOU KIDDING ME?!?!?!" This was an interesting book. Not sure if it work in movie form. I almost wish Disney would take it back. This isn’t even in the seven Chronicles. This is a spin-off book. C. S. Lewis himself never wrote it. I’ve never read the book but I don’t want it wth the actual serise. But before I get angry ( 🙂 ), I think this is an April Fools Day joke. Hmm, why Summer 2013? I say they should release it a little earlier in the year, maybe in the Spring. In fact, April is probably the best time to release a Narnia movie. It’d be Foolish to do otherwise. I thought we were done with the April Fools jokes…although I do have to admit that I like to see what you guys come up with for today! I hope this IS an April fool’s day joke! Michael Apted must think it’s great for marketing to today’s kids. haha I saw that on facebook…this one is actually more believable!!! This has to be an April Fool’s joke. Right?? Thanks Narniaweb’s April Fool’s. Love it! Wouldn’t it be all the more hilarious if the April Fool’s joke were that these stories were real? One of these times you’re going to have a true story that’s so outlandish and I hope it’s on April Fool’s. April Fools, April Fools. Er, right? Probably. funny joke–I think ? how did you make an Amazon listing ? I couldn’t believe D Grisham sold out ? Oh the book is real, movie isn’t ! ha ha ha.. clever. ‘By mixing a little bit of truth with it they made their lie far stronger…’–the Last Battle. Am I right ? Ah, hahahahahaha. . . Ya, right. Again, another Disney disaster. What happened to the good old Disney movies? Who would actually go and see a movie about marsh-wiggle who go rescue mice? C.S. Lewis was much more creative. And what about Disney dropping Narnia because they weren’t making enough money to fill their drooping pockets. When will they pay for their folly and lack of imagination? This must be April fools, I’m not buying this. Is it April 2nd yet???? This had better be a joke cause otherwise I’m gonna lock myself in my room eating icecream the rest of my days with my hundreds of cats screaming "NOOOOOOOOOOOOOOOOOOOOOOOOOOOOOOOOOOOOOOOOOOOOOOOOOOOOOOOOOOOOOOOOOOOOOOOOOOOOOOOOOOOOOOOOOOOOOOOOOOOOOOOOOOOOOOOOOOOOOOOOOOOOOOOOOOOOOOOOOOOOOOOOOOOOO!!!!!!!!!!!!!!!!!!!!!!!!!!!!!!!!!!!!!!!!!!!!!!!!!" Sure. I take a little rest from this site only to find someone fooling about. Though I can understand you human folk having your day of frivolity and all, but could anyone really expect to take such a tale seriosly? After all, what good Marsh-Wiggle would wear such a silly smirk as that on his face? True. I would call it a very bad misconception about marshwiggles and their habits. APRIL FOOLS!!! Lol nice one. Was this even a book? Haha you guys got me! I was so worried. Still… I despise Disney.